This Shochu is made from special sweet potatoes called Koganesengan, which are grown in Kagoshima prefecture. 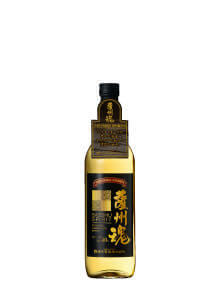 It is fermented with Kuro koji mold and distilled by an atmospheric distillation method. With its fresh taste, Kaido goes well not only with Japanese cuisine but also with meat, fish and noodles. 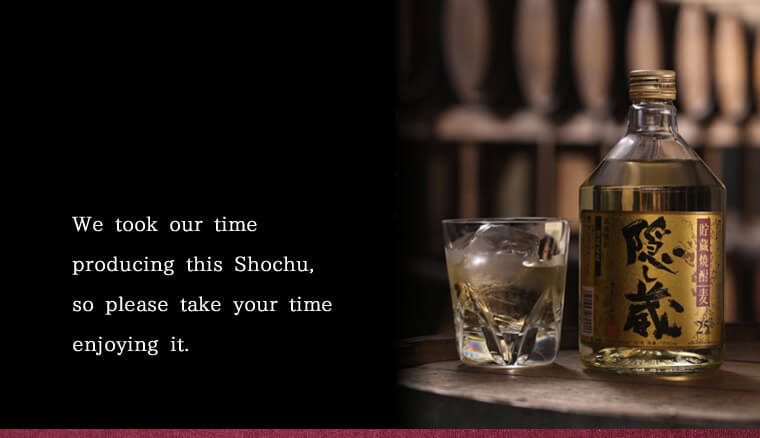 The taste of your meal will be greatly enhanced when enjoyed with Shochu. This shochu features the full fragrance of sweet potatoes and the full bodied sweetness unique to Kuro koji mold. Koji mold determines the taste of Shochu. Therefore, we use 100% domestic rice as an ingredient to enhance the deliciousness. Kuro koji mold brings out the rich and sweet taste of sweet potatoes. 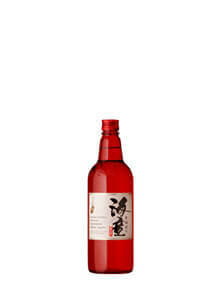 It also indicates that this Shochu is safe and of the highest quality. We use quality sweet potatoes ‘Koganesengan’ grown in Satsuma (Kagoshima) as an ingredient. 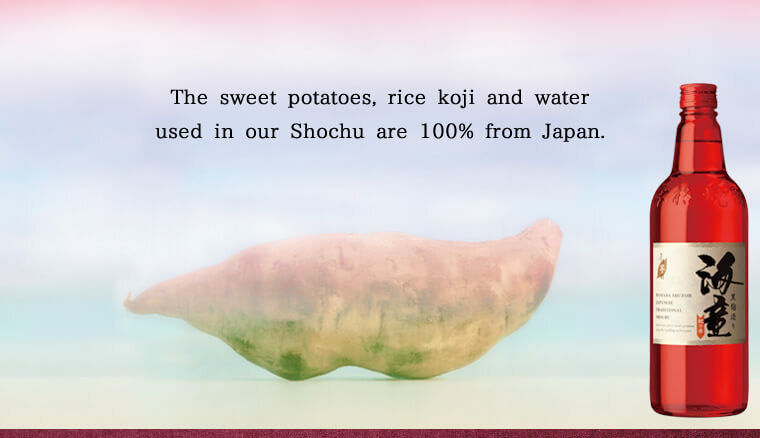 Kagoshima-grown Koganesengan sweet potatoes are the most popular variety being used as an ingredient of Shochu. This is due to its large yield, richness in starch, its flavor, and the authentic taste of sweet potato. 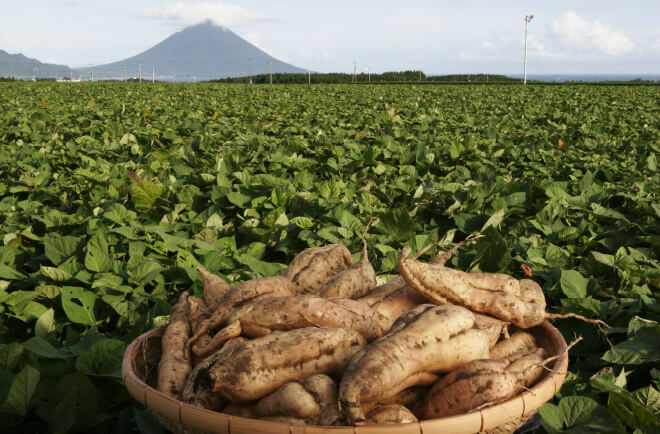 As for the raw material of Kaido iwainoaka, the high quality Koganesengan sweet potatoes grown in Satsuma (present day Kagoshima) soil are used. Only the freshest sweet potatoes, chosen through hand sorting, are used. Fresh Kagoshima-grown sweet potatoes are used. This Satsuma Honkaku Shochu is a blend of the unrefined shochu of Benisatsuma and Koganesengan, both of which are known for their sweet taste. The rich and mellow taste of the Shochu goes perfectly well with meat dishes of pronounced flavor and Chinese foods. 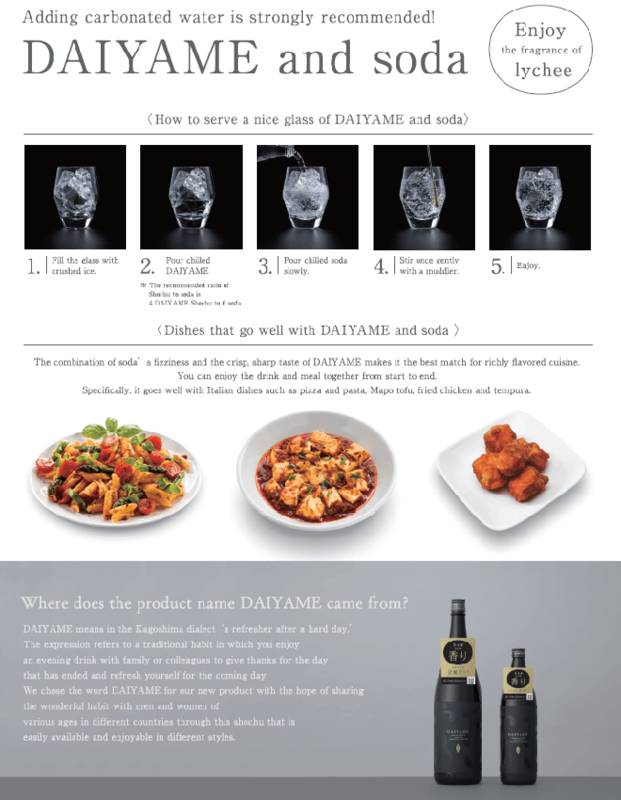 The taste of your meal will be greatly enhanced when enjoyed with Shochu. This Shochu features a fruity fresh flavor and the full sweetness unique to Kuro koji mold. Denzoingura Distillery is located in Ichikikushikino City where 19 young samurai warriors known as Satsuma Students left for the UK. They would likely have viewed the sun setting into the East China Sea from Hashimaura, Ichikikukshikino City. 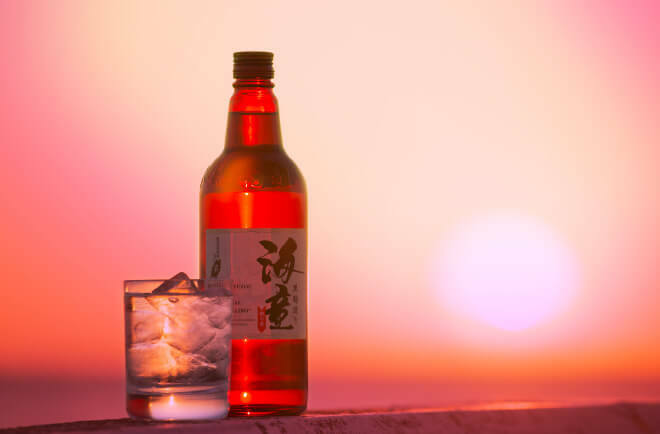 Our red bottle represents this setting sun. The taste of various dishes will be greatly enhanced when enjoyed with Shochu. Kaido iwainoaka features a refreshing yet crispy, and rich and mellow taste. It goes well not only with Japanese cuisine but also with Italian and Chinese cuisine. You can enjoy it while having a meal. 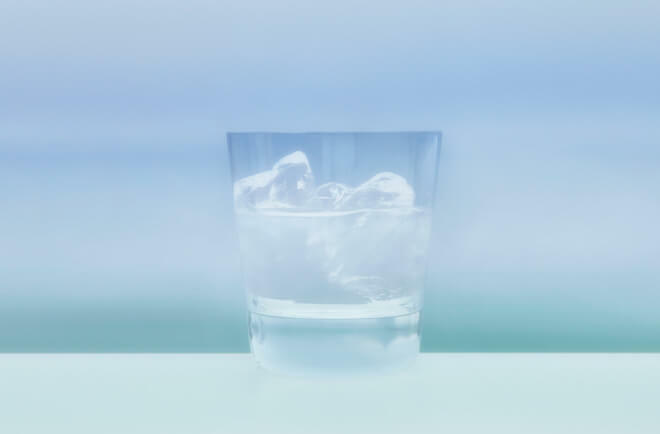 Kaido iwainoaka is exceptional on the rocks, mixed with cool or hot water, as well as straight. 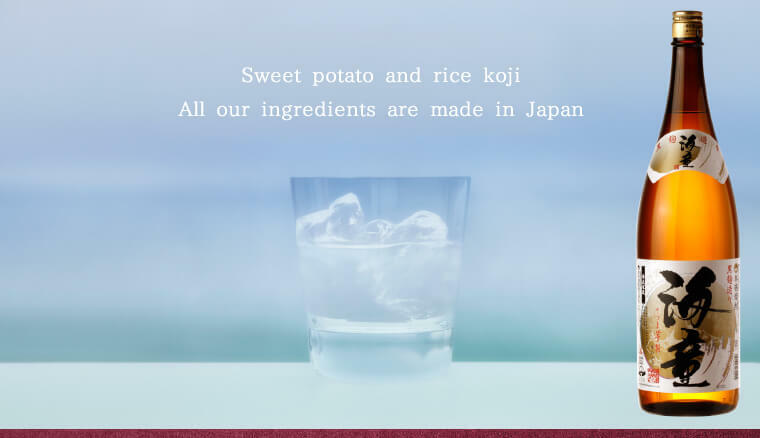 ‘Sweet potato highball’, Shochu mixed with soda, is also recommended. 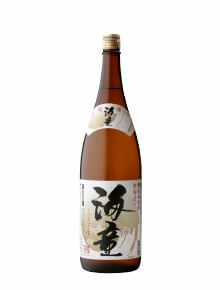 This matured barley Shochu has a wonderful taste produced after a long period of time. Behind the mild and smooth oak taste emerges a hint of sweetness. Aging in oak barrels produces the rich flavor and taste. 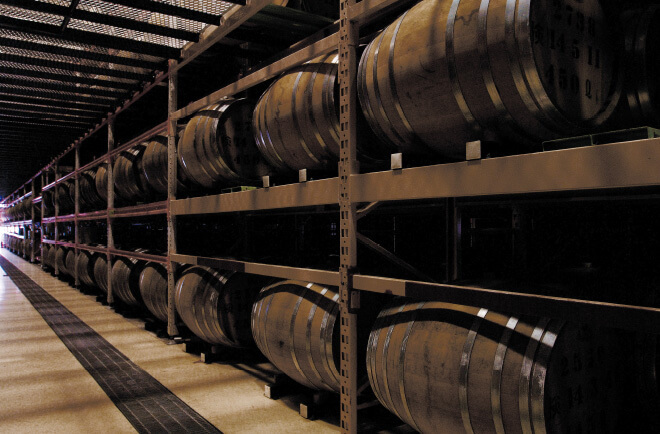 Our carefully selected unrefined barley Shochu sits in oak barrels for aging. The color slowly changes into an amber color with fragrance and good taste. The more it matures, the more it brings forth the fragrance of the oak barrels. To blend in a well-balanced way, the storage length is set from 1 to 3 years. 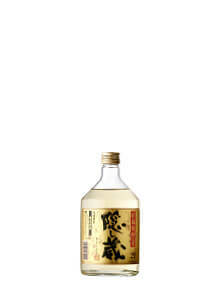 At the end of this time period, this Shochu will have taken on the fragrance and taste that goes so well with meals. 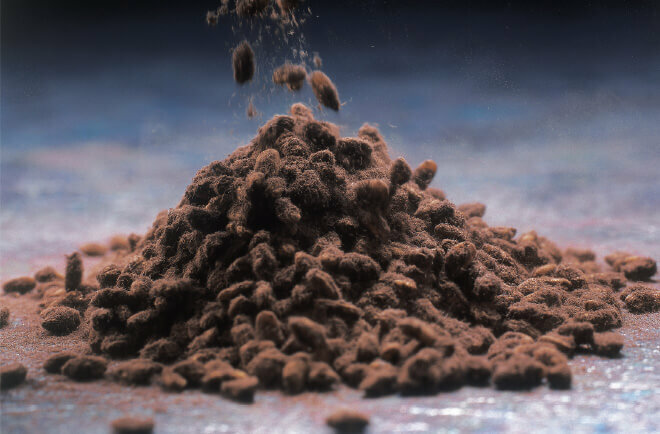 The new aroma comes from the ‘Koujuku-imo’ developed using a new aging method. The traditional imo shochu is made from the ‘Koujuku-imo’ we developed using our original technology. You will be surprised as the fragrant aroma (like that of lychee) fills your mouth. The product features a sweet and mellow taste and a crispy aftertaste. The design concept is to make it possible to enjoy the fragrant aroma and the meal together from the beginning to end. The aroma becomes more intense when diluted with strong carbonated water. ‘Koujuku-imo’ ・・・ We developed it independently by multiplying the components which bring out an abundant amount of aroma. 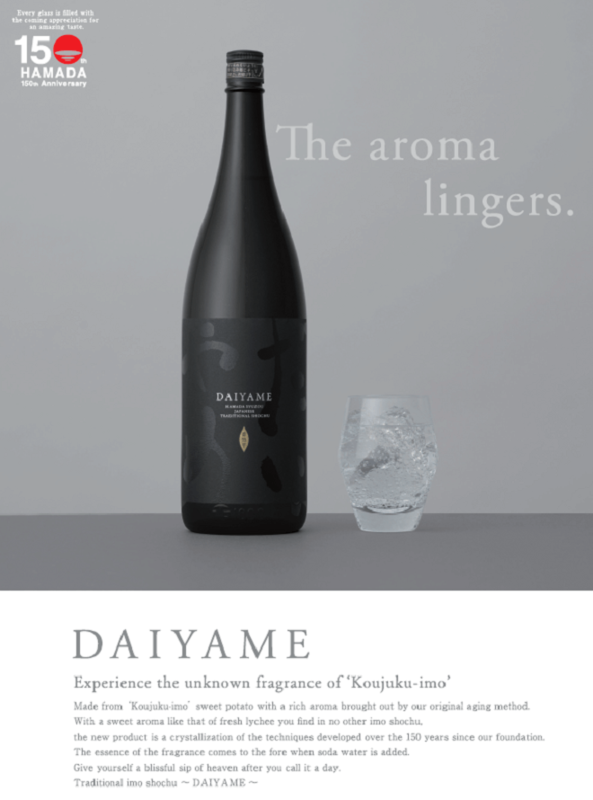 DAIYAME is marked by a fragrance like that of fresh lychee coming from the monoterpene alcohol (MTA) contained in large amounts in Koujuku-imo. New liquors with different flavors and tastes have debuted one after another recently in the alcohol beverage market with the goal of capturing the changing needs of consumers. 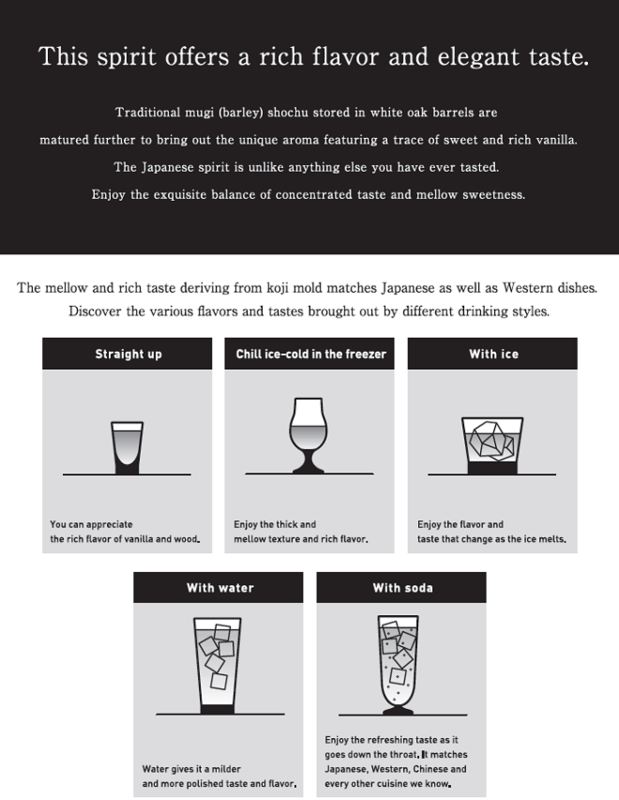 We developed an original method to combine traditional shochu with a flavor derived from koji mold and white oak and launched Japanese Spirit SASSHU SPIRIT in bottles (net volume: 700ml and 40% alcohol content) featuring a vanilla-like sweet and rich aroma, mellow sweetness and concentrated flavor. 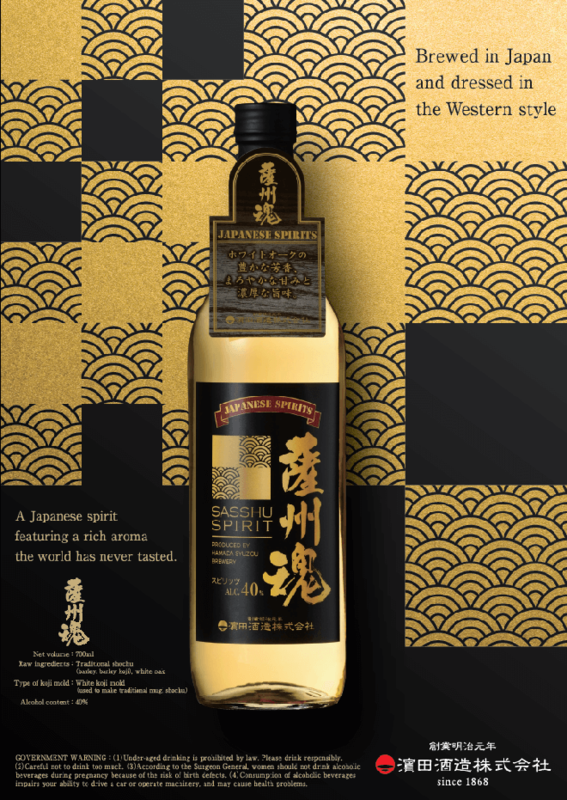 The Japanese spirit combines a vanilla-like sweet aroma, mellow sweetness and concentrated flavor in an exquisite balance. Enjoy it in different ways: straight up, on the rocks, with water or with soda. It is strongly recommended for people looking for liquors with a new flavor or taste. 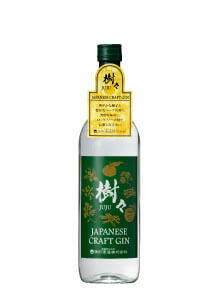 Made from traditional rice shochu brewed with our original flavored yeast and seven herbs such as domestically produced citron, the Japanese Craft Gin is a new product specially developed by a brewery of traditional shochu with 150 years of history. 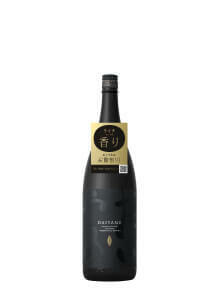 The combination of the elegant aroma, mellow texture and rich taste of traditional shochu, deriving from koji mold and yeast, and the flavors of the seven herbs (such as citron) which are extracted slowly and carefully, makes the characteristic flavor and taste. ・You can enjoy it in different ways. 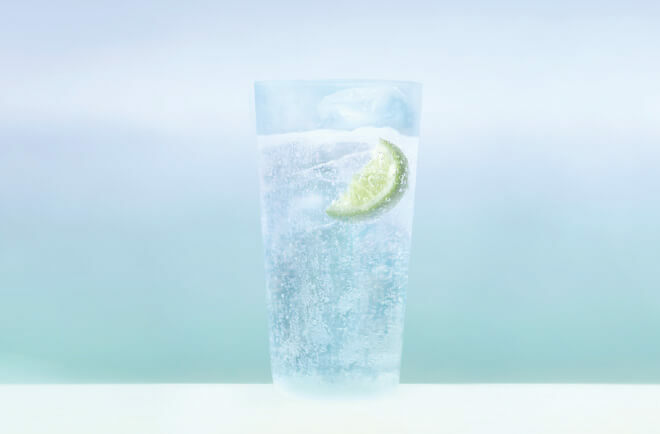 Adding soda (carbonated water) is strongly recommended since it is the best way to emphasize the rich aroma. ・Mix JUJU with carbonated water at a ratio of 1 : 2, and you will enjoy the rich flavor and a multifaceted taste. This is particularly true if you take the time to enjoy it after a meal with light finger food such as boiled green soybeans, cheese or crackers. The mixture of JUJU : soda = 1 : 4 makes the refreshing flavor more outstanding. The drink goes great with flavorful dishes (such as stewed meat and spicy ethnic dishes) from the beginning to the end of the meal.